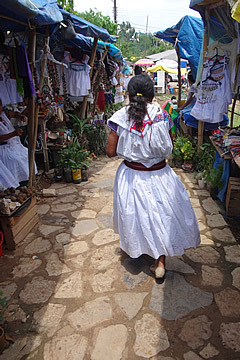 A great day taking in a wonderful fiesta in Yohualichan as well as the impressive Gulf Coast-style ruins and a busy market in Cuetzalan. 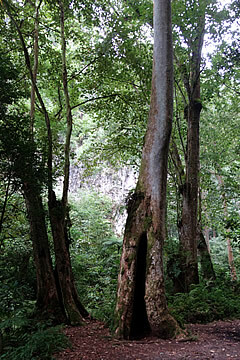 Magnificent tree ferns in La Gloria forest. 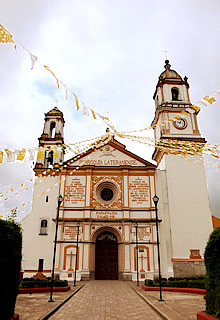 We were saying in Puebla and set off very early one morning to visit the ancient site of Yohualichan and the town of Cuetzalan. 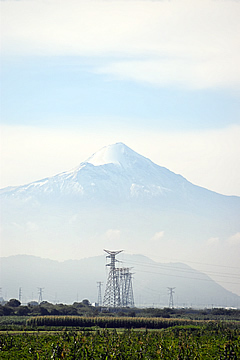 We passed through beautiful landscape, with clear views of the volcanoes Popocatepetl and Iztaccihuatl which stand close together not far from Puebla. 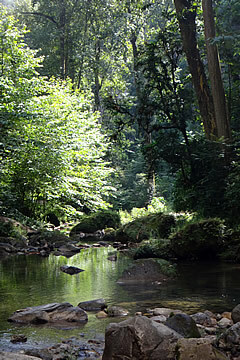 Forest walk to La Gloria. Later we were able to see the highest volcano and highest mountain in Mexico - Pico di Orizaba or Citlaltepetl which is Nahuatl for star mountain. 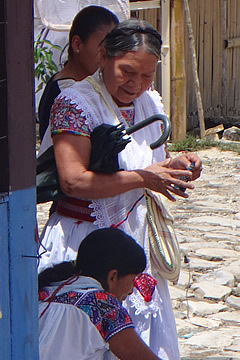 Nahuatl is the ancient language of the Aztecs and is still spoken by many, especially in the areas we were visiting today. The drive was through a lovely fertile landscape. 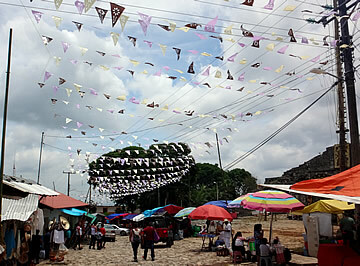 A huge plain seemingly covered with maize fields and dotted with trees and colonial haciendas. 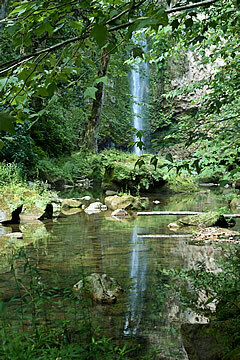 About 30km south west of Cuetzalan we stopped to visit La Gloria, a lovely waterfall dropping into a blue pool reached by a short peaceful walk through the forest to the sound of birdsong and flowing water. 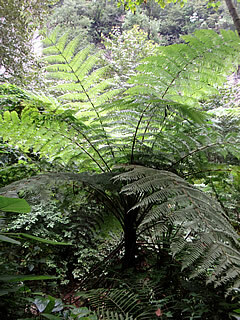 There are some beautiful tree ferns here which our guide told us are prehistoric and protected. 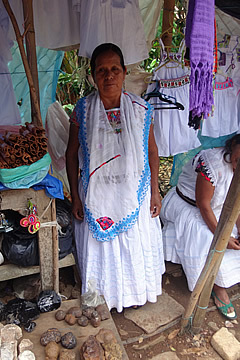 The women wear beautifully embroidered dazzling white dresses with lace shawls. Over the mountains the landscape is very lush and tropical with lots of ferns and banana palms and, in one area, many spiky trees which might have been Joshua trees. 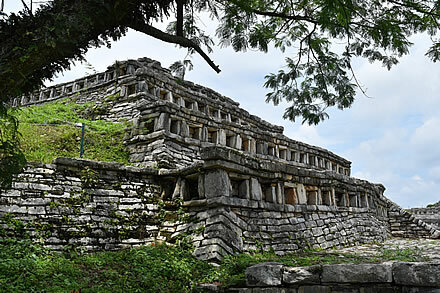 We first visited the archaeological site of Yohualichan north east of Cuetzalan before returning for lunch. 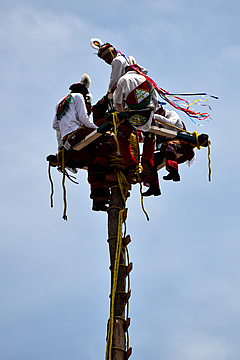 In Yohualichan we were incredibly lucky as there was a fiesta and six of the local men were performing a very traditional ceremony descending a tall pole suspended by ropes, doing acrobatics, all dressed in red and white. 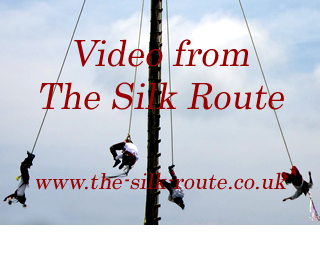 Our guide said he had never seen it done with this many participants before. 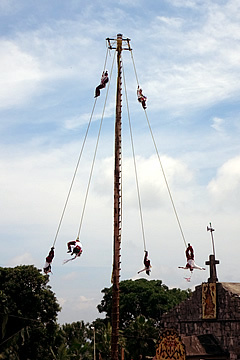 It is called Danza de los Voladores or Dance of the Flyers and is an ancient Totonac ritual - the Totonacs are the indigenous people of this region. 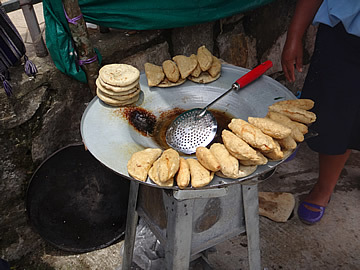 As with any Mexican fiesta there were a large number of stalls selling freshly cooked food. 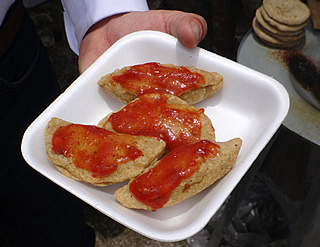 Thick tortillas filled with chicken, deep fried and served with a spicy sauce. 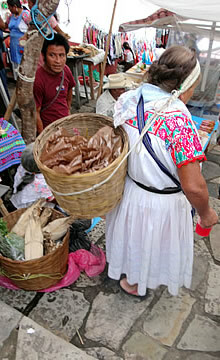 We gave this lady a tip to allow us to take a photograph - there was a deal of haggling! I was fascinated by her teeth which were pointed and must have been filed. Information board showing the main ceremonial area and ball court on the right (south). The village fiesta was a lucky bonus. 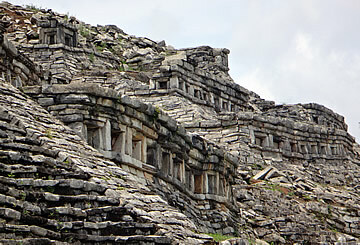 Our main aim in coming to Yohualichan was to see the ancient Totonaca site with very distinctive architecture. The information boards here were very good in providing the history and putting the site in context with other ancient cultures. 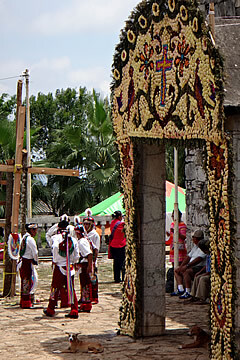 Yohualichan is Nahuatl for "House of the Night". 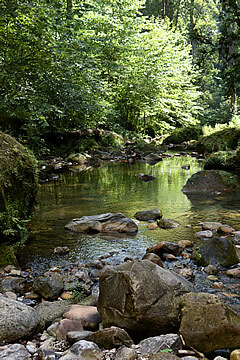 The site was occupied for a very long time, from 400 AD to the conquest in the sixteenth century, reaching its peak around 700-800AD. 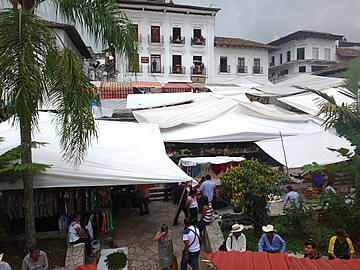 The Main Plaza looking roughly south west. 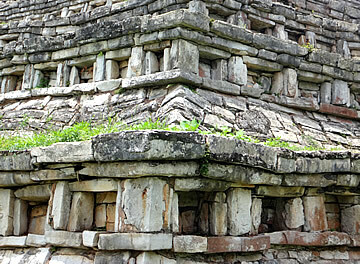 The central pyramid is the Edificio de las Grecas. 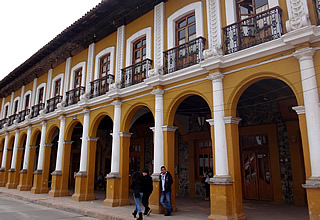 At the end is the back (south) side of Edificio de las Grecas on the main plaza. 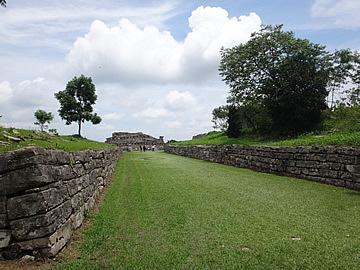 The ball court playing area is a single narrow strip with no end parallel sections to form an I shape that we have seen in many other places. The edging walls are quite high before, presumably, the traditional sloped area begins. 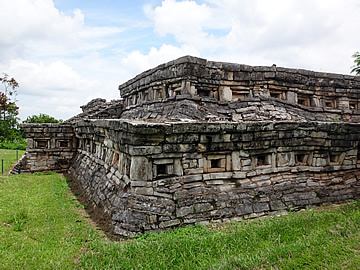 Yohualichan was founded by the Totonacas who are also said to have built the Pyramids of the Sun and Moon at Teotihuacan, and El Tajin and Coatzintla in Veracruz. 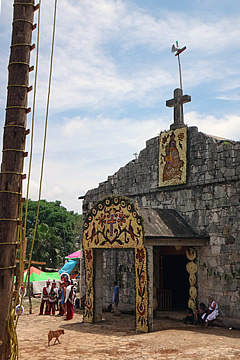 Around 800 the Toltecs arrived and were in power for around 400 years, succeeded by numerous other groups. South side of Edificio de las Grecas. 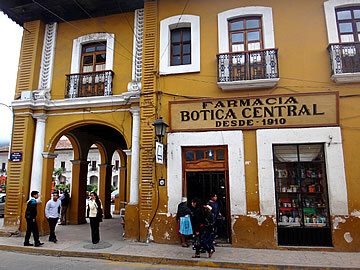 Edificio de las Grecas is named for the fret (greca) of stucco decoration. 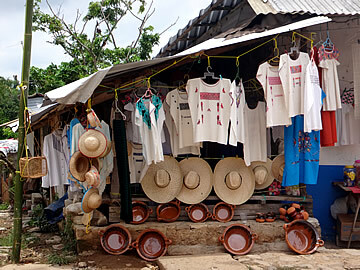 Yohualichan shares an architectural style with the more famous El Tajin, about 50km as the crow flies to the north, and is thus thought to have strong cultural associations with this Gulf of Mexico site - no other sites in Puebla resemble it at all. 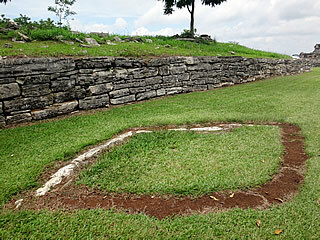 A curious diamond-shape edged in stone in the centre of the ball court may perhaps have served the same purpose as the modern day centre spot in football - the point where the game commenced. We had certainly not seen anything like it in all our travels, in particular the incorporation of rows of blank window-like niches along the terraces of pyramids. 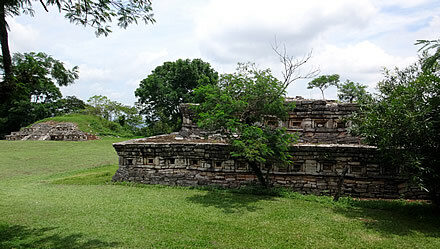 The main plaza is unusual in having two connected pyramids on the suth side and a third at right angles on the west side forming an unbroken wall around the plaza. 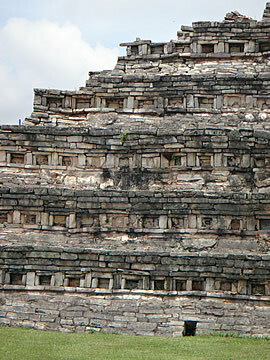 At the SW corner is a staircase descending into the plaza. 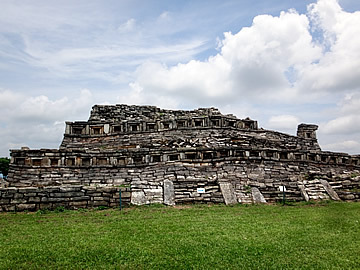 Pyramid on the west side of the plaza with steps in the corner leading down. 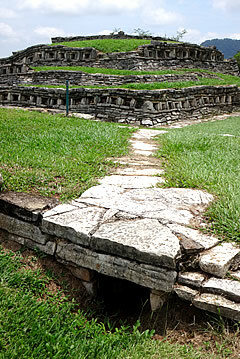 A lower terrace of the Edificio de las Grecas extends back towards the ball court - this tunnel was discovered leading under the terrace. 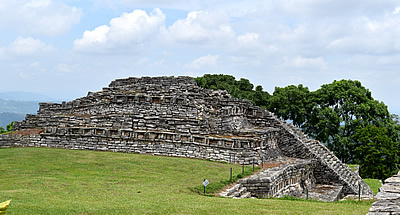 Behind is the east pyramid on the south side. Rulers lived in their palaces but the city was run by priests and warriors. 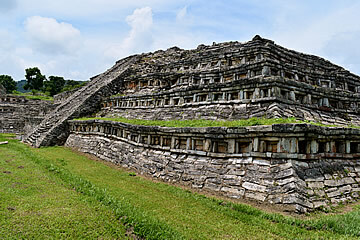 Temples, a ball court and administrative buildings were gathered around the central plaza, domestic buildings outside. 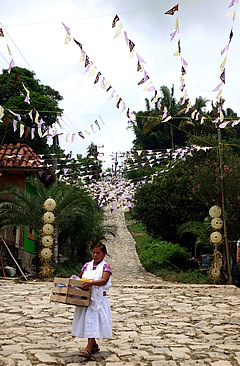 Terraces were strengthened with retaining walls to provide sturdy platforms for homes and neighbourhood chapels. South side Edificio de las Grecas. 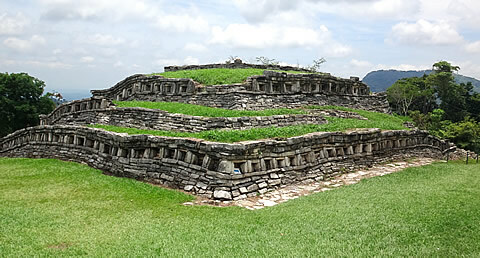 SW corner of the east pyramid on the south side of the plaza, next to Edificio de las Grecas. 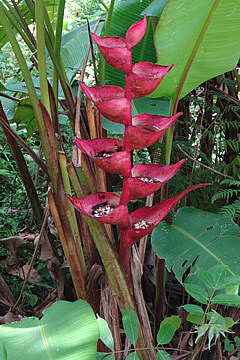 A type of heliconia I think. 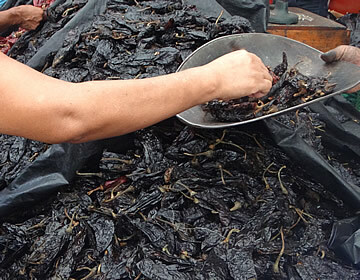 In an extraordinarily fertile region, warm with year-round rain, the vast majority of the people have always worked on the land. 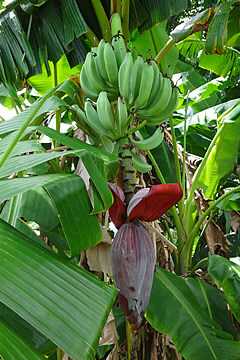 It is for this reason that Yohualichan became very prosperous and a prime target for invasion. Housing patterns in the dispersed farming regions today echo the ancient layout of a palm-bamboo or wooden house on the edge of a corn field. East pyramid on the south side of the plaza. 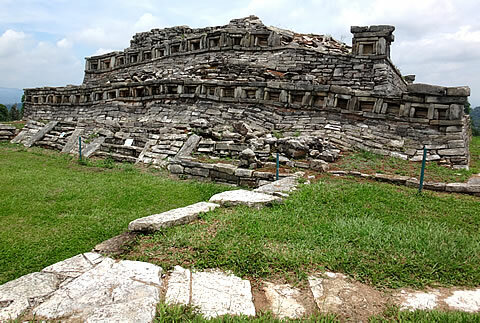 West pyramid with Edificio de las Grecas at right angles on the left, a staircase leading up from the plaza where they join. The pyramids are built in a talud-tablero style - stacked platforms of decreasing side with sloped bases - most famously seen at Teotihuacan. 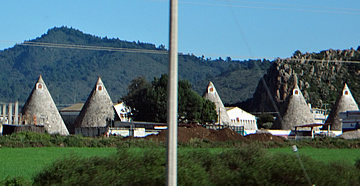 South east pyramid and Edificio de las Grecas. 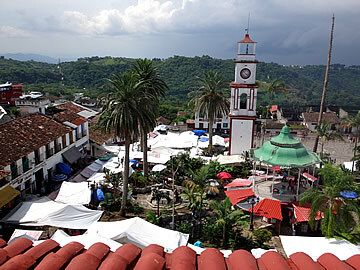 From Yohualichan we drove to Cuetzalan. 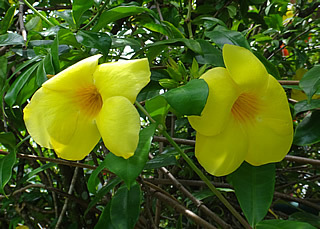 Around here there are masses of Brugmansia, mostly yellow but white and pink too, and lots of other colourful flowers. 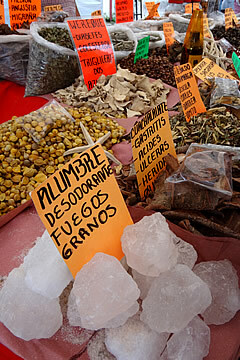 It was market day and we spent some time wandering among the stalls looking at all the different things for sale. 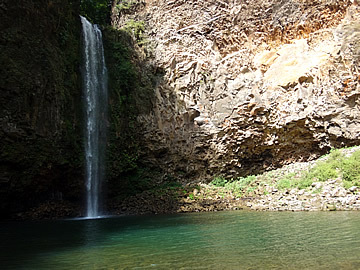 It is an out-of-the-way place and the only people here apart from us were Mexicans. 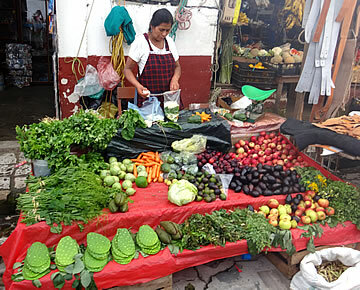 I had had nopal (prickly pear) salad in Tepotzotlan, though I can't say it was a very memorable taste. 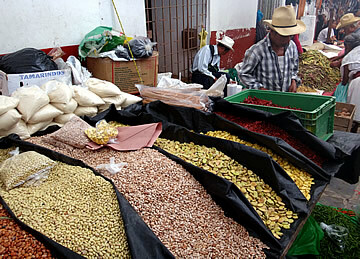 Dried beans, chilies and pulses. 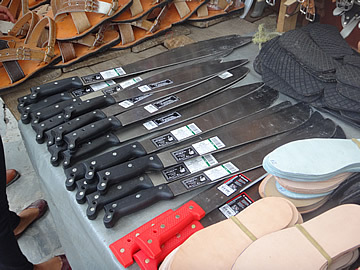 Machetes, an everyday tool here. 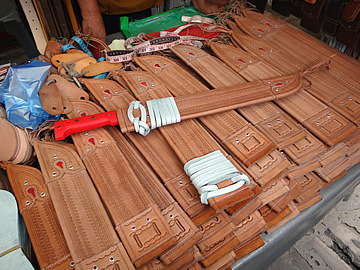 Beautiful leather sheaths for the machetes. Always masses of beautiful tomatoes. 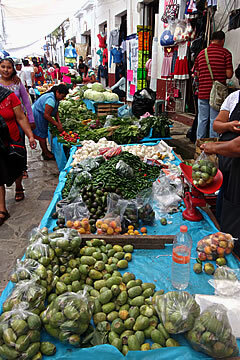 Tomatoes are an indigenous crop and were an important part of the diet long before the Spanish arrived to take them to Europe. 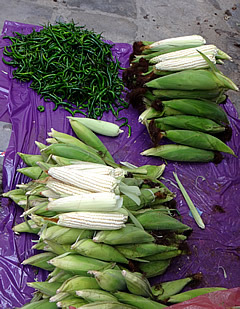 Corn was the most important crop in the ancient cultures; three additional staple foods were squash, beans and chili peppers. 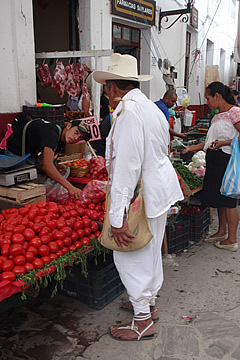 The streets are shaded with huge white sheets - the sun can be very fierce here but today was cooler and cloudy so very comfortable for wandering the market. 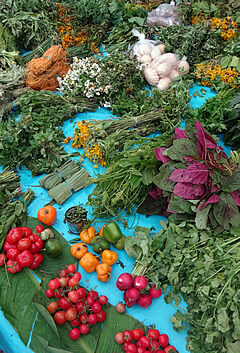 A beautiful array of herbs and dried flowers, possibly used for medicinal purposes. 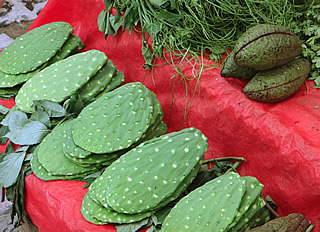 In the foreground the fruits of the prickly pear cactus (nopal), another ingredient of the diet here, probably for thousands of years. 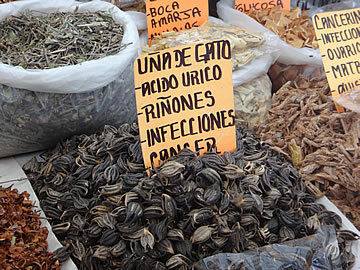 Medicinal compounds, including wereque, said to be good for diabetes among other ailments, and Alumbre or alum stone. 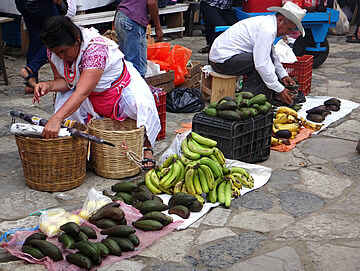 Probably a husband and wife team come in from the countryside to sell their avocados (I think, though I've never seen them quite like this anywhere else) and bananas. 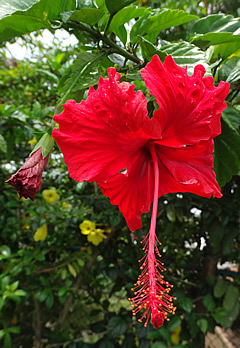 Numerous medical benefits are claimed for Cat's Claw, including in the treatment of infections, arthritis and ulcers. 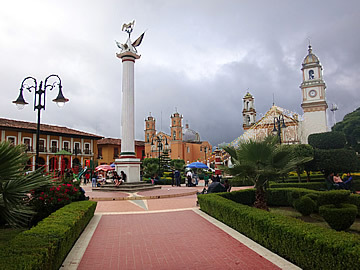 The centre of the town is the Zocalo, with a shady park and large church. 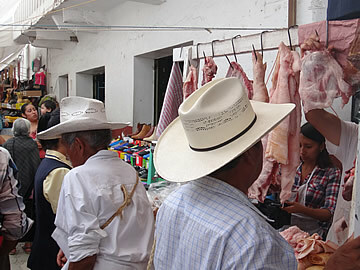 All around the market stretches through the shaded streets and up the steps leading through the town, busy with people. 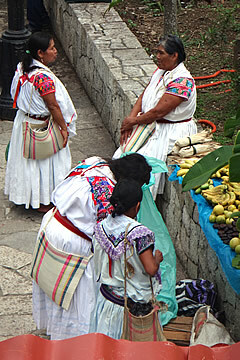 The beautiful traditional dress is slowly giving way to modern clothing. 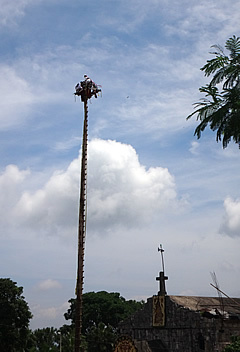 The tall pole is for the Danza de los Voladores. 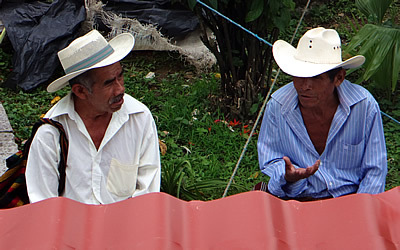 In the green Zocalo the people gather to rest, watch the world go by and chat. 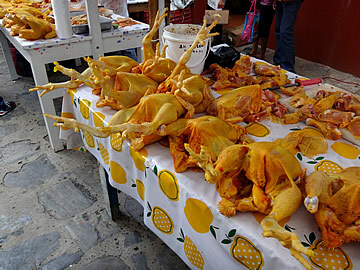 We ate in a restaurant high above the Zocalo with a fine view over the town. We started lunch outside on the roof dining area but retreated inside when a thunderstorm hit! 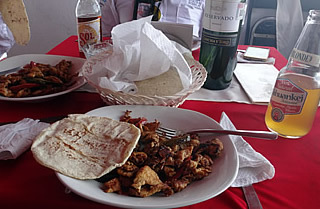 Fajitas and an artisanal beer for lunch - cloudy but good. 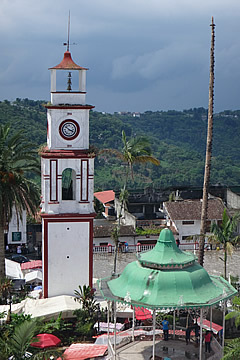 The church and town hall on the edge of the Zocalo. Looking down on the Zocalo from the restaurant. 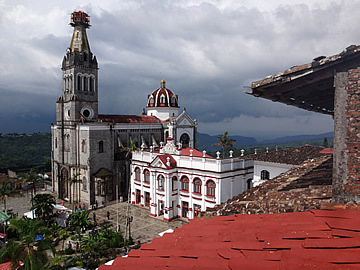 We had some difficulty getting out of Cuetzalan, the car couldn't make it up one slope because the tyres kept slipping on the cobbles and we had to make a detour. 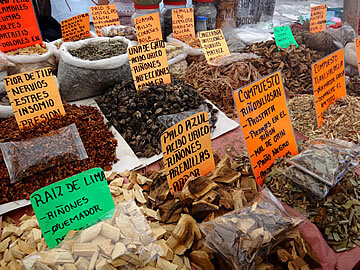 But we were soon on our way for the three hour drive back to Puebla. On the way we stopped at the small town of Zacapoaxtla where we seemed to cause some amusement, especially amongst the youngsters. 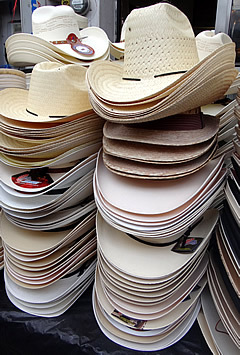 It reminded me of travelling to Japan in the eighties and the orderly files of schoolchildren who found me highly amusing! On the Zocalo one man stopped us to shake hands and ask where we were from. 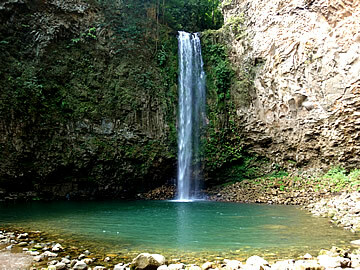 It was all very genial.